Facebook Activity Spy lets you know EXACTLY what others do on your PC while you are away. It secrectly logs all Facebook use keystrokes web visits emails chats & IMs: Windows Live Messenger Yahoo Messenger Skype and other IMs. 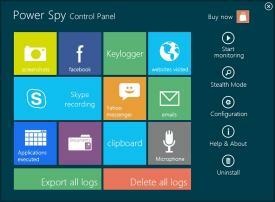 It logs applications documents clipboard user names passwords video talk video played and more. It also takes screenshots at every X seconds like a surveillance camera. In Stealth Mode it is completely invisible to monitored users. However it is easy for you to unhide its main program Control Panel with your hotkey view logs secretly from its CP on the monitored computer directly or receive log reports via your custom email or ftp server! These reports can be sent as often as you wish like every sixty minutes (ajustable). It is perfect for catching cheaters monitoring employees children and spouse acquiring others passwords chat records and websites visited and even investigating crimes.